We have all of these documents with our personal information on them but how should we store them? Is it safe to keep them all in a file in the desk or should we be storing them elsewhere? In this article we’ll help you find a safe place for your private documents and protect your personal information. We’ll also teach you how to back up these documents in case there was a natural disaster, fire or the documents got destroyed another way. What Personal Information is Worth Protecting? So, what exactly is this personal information that you need to protect? Basically, anything that has your social security number, financial information, account numbers or is a government issued document needs to be protected. How should you protect these things? You have three options: online, in a fire-proof safe or in a safe deposit box. How Can You Protect Your Personal Documents Online? First of all, it’s important that you try your best not to share your personal documents with anyone over email or online. We know this isn’t always possible so when you do have to share your documents online, follow these guidelines. Be selective with whom you share your information with. Make sure you know the person and you have their contact information correct. All passwords should be strong. This includes the computer login, user login, online login, email login, etc. Password protect your document when possible. What Should You Keep in a Fire-Proof Safe? First lesson, make sure it’s a fire-proof safe. If your home is destroyed in a fire you’ll want to make sure that the items in your safe are still protected. Now, what should you include in the safe? The rule we go by is: stuff that has your private information on it and you may need it at short notice. 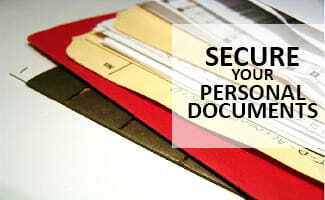 This includes personal items that may have a higher value but also documents with your private information on them. Below is a list of items to put in the fire safe as well as reasons why. Personal Items – Items you hold near and dear should be placed in here (family heirlooms, photos, etc.). If you place photos in the safe put them in digital form to save some room! Safe Deposit Box Keys – If you have valuables at the bank you’ll want to make sure that the key is safe. Copies of Wills – This includes your will as well as a will you are the designated executor for. Funerary Directives – In the case of an emergency so people can plan arrangements accordingly. Insurance Policies – You’ll need this information immediately if your home suffers any fire damage. List of Family Doctors and Prescriptions – If you need a new supply of your medications. Papers Regarding Retirement Plans and Bank Accounts – You don’t want this information getting into the wrong person’s hands. Legal Documents – This includes powers of attorney, living wills, health care proxies, taxes, etc. Spare Keys and Vehicle Titles – You don’t want to misplace these so keep them safe. But are there documents you shouldn’t keep at home? Maybe a place even more secure than your home? What Should You Keep in a Safe Deposit Box? We know that this sounds like a daunting task but it’s a task worth taking on! It’s important that you keep your personal documents safe. That’s why we urge you to go secure your personal information now before it’s too late. Need to know where you should secure a document? Ask us!